The term corked is used to describe a bottle of unopened wine that has a fault typically identified through a malodor similar to that of wet cardboard or damp basement. The wine itself is still drinkable and will cause no harm, but the drinker’s pleasure will be greatly reduced. Studies of the frequency of cork taint vary wildly, but a study in 2005 by the Wine Spectator showed that of 2,800 bottles blind tasted, 7% had cork taint. Cork taint is caused by the presence of 2, 4, 6-trichloroanisole (TCA) which occurs when natural fungi are confronted with certain chlorides found in some pesticides, preservatives, and even bleaches used for winery sterilization. TCA may be confined to a single batch of cork or sometimes overtakes an entire cellar which then needs to be completely cleaned or even rebuilt to eradicate the problem. The wine industry has been trying for years to come up with a solution to the TCA problem. Consumers returning bad bottles to stores or simply forming a negative opinion of wine in general are of no value to anyone in the industry. Some winemakers have been experimenting with plastic corks, screwcaps and glass stoppers, while the cork industry has striven to reduce the amount of taint experienced. 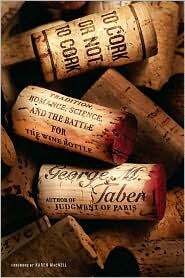 It is in this book, To Cork or Not to Cork that George M. Taber (author of The Judgment of Paris) examines the evidence for cork as well as its many supposed alternatives. From all angles including scientific, historical, and even sensorial he builds the case for each closure and leaves the reader contemplating something so often overlooked in the drinking experience.